Encountering property fraud can be one of the worst experiences in your life. Knowing how to identify these scams can help your family to avoid unnecessary loss and litigation. 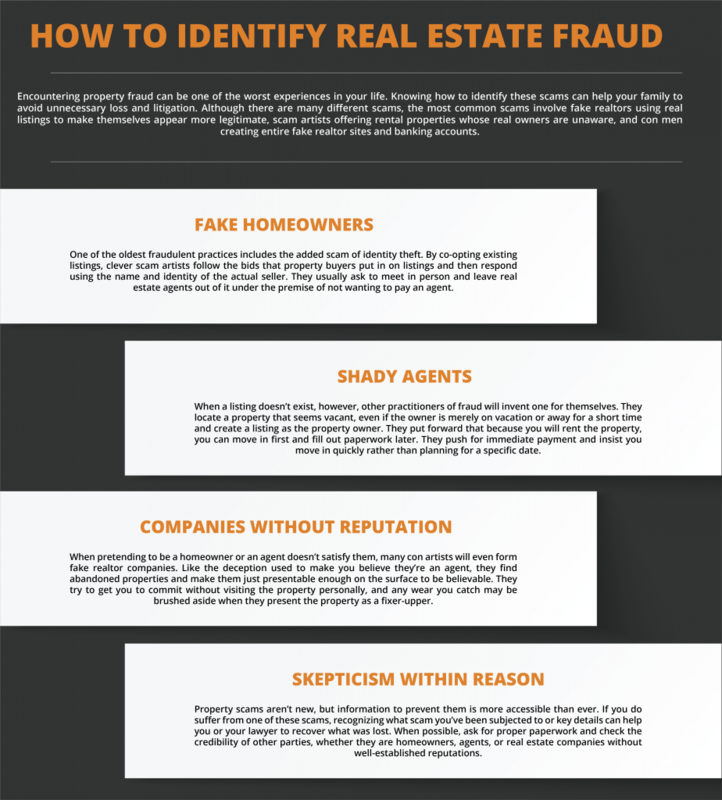 Although there are many different scams, the most common scams involve fake realtors using real listings to make themselves appear more legitimate, scam artists offering rental properties whose real owners are unaware, and con men creating entire fake realtor sites and banking accounts. One of the oldest fraudulent practices includes the added scam of identity theft. By co-opting existing listings, clever scam artists follow the bids that property buyers put in on listings and then respond using the name and identity of the actual seller. They usually ask to meet in person and leave real estate agents out of it under the premise of not wanting to pay an agent. When a listing doesn’t exist, however, other practitioners of fraud will invent one for themselves. They locate a property that seems vacant, even if the owner is merely on vacation or away for a short time and create a listing as the property owner. They put forward that because you will rent the property, you can move in first and fill out paperwork later. They push for immediate payment and insist you move in quickly rather than planning for a specific date. When pretending to be a homeowner or an agent doesn’t satisfy them, many con artists will even form fake realtor companies. Like the deception used to make you believe they’re an agent, they find abandoned properties and make them just presentable enough on the surface to be believable. They try to get you to commit without visiting the property personally, and any wear you catch may be brushed aside when they present the property as a fixer-upper. The most dedicated scammers may even establish fake agency websites and accounts. Many realtors earn a commission from selling properties. These online frauds may not even aim for the money earned from selling or renting the property, but instead, ask that their commission is sent to a personal bank account. Once the money for suggesting the property to you and showing you around has been earned, they may keep up the fraud or quit with their earnings. Property scams aren’t new, but information to prevent them is more accessible than ever. If you do suffer from one of these scams, recognizing what scam you’ve been subjected to or key details can help you or your lawyer to recover what was lost. When possible, ask for proper paperwork and check the credibility of other parties, whether they are homeowners, agents, or real estate companies without well-established reputations. ← Can an unmarried mom claim maintenance from the father’s pension?